Bought by the Trust in 2001, No. 60 is part of a range of tenements, formerly known as Lady Row, standing between Holy Trinity churchyard and the street, is basically of plastered timber framing but partly faced or rebuilt in brick, and has pantiled roofs. A deed to build a range, 128 feet long and 18 feet wide, on the churchyard was granted in 1316, the rents to be used to endow a chantry of the Blessed Virgin in the church. 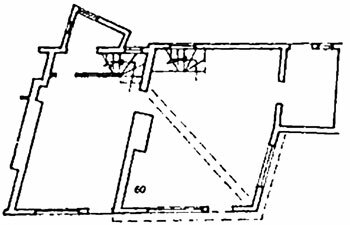 As built, the range was of two storeys, eleven bays long; generally each bay formed a single tenement with one room on each floor, but at least one tenement, and probably two, occupied two bays. 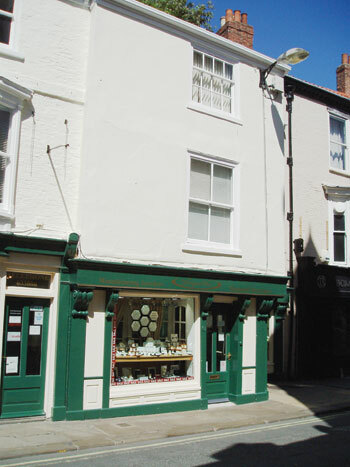 A separate house, 24 feet by 16 feet, was to be built in the churchyard for the chantry priest. In a late 16th century rental, the range consisted of three cottages and one tenement let at 2s each, three tenements at 2s 4d each, one at 4s and one at 6s. The house at the south end was demolished, certainly no later than the mid 18th century when a new arched gateway to the churchyard was built in its place. The next two houses to the north formed The Hawk’s Crest public house between 1796 and 1819. 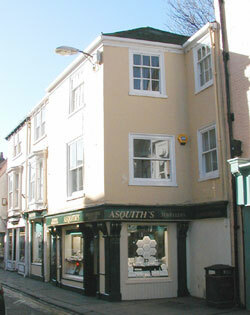 The second and third bays from the north end were rebuilt shortly before 1784 by John Lund as a pair of three-storey brick houses, and in the second quarter of the 19th century the house at the north end of the range was heightened to three storeys and a narrow extension to it built over the old entrance to the churchyard adjacent. This last house was The Noah’s Ark public house in 1878. In 1827 there was a proposal to open the churchyard out to the street by pulling down the whole range; though this was not carried out, the former chantry priest’s house, described as ‘dilapidated cottage tenements called Trinity Court’, was demolished. The range is of considerable importance as the earliest timber-framed building surviving in the City. Though the external appearance has been greatly altered, the basic structure of seven bays remains largely intact. On the front elevation the original infilling between the posts on the ground floor has been replaced by shop fronts and brickwork; several of the posts have greatly enlarged heads to support the jetty above. The first-floor wall is plastered and the windows are mostly Yorkshire sashes, none earlier than the 18th century. The back elevation, which was never jettied, is plastered, with brick facing lower down. No. 60, at the north end, retains some main framing, though not directly visible; the first floor has a dragon-beam, indicating that the end wall was originally jettied towards the former churchyard entrance.